Stories have quickly taken over the social media space. What first was only a Snapchat feature has expanded to nearly every social media platform launching their own, including Facebook. Since they launched the feature, Facebook is making a bigger push to get more users to use the Stories tool. In fact, Twitter user Chris Messina noticed that nearly “every 5th item” in his newsfeed was a stories block, suggesting Facebook is trying to increase engagement with the asset by placing it where users are looking. 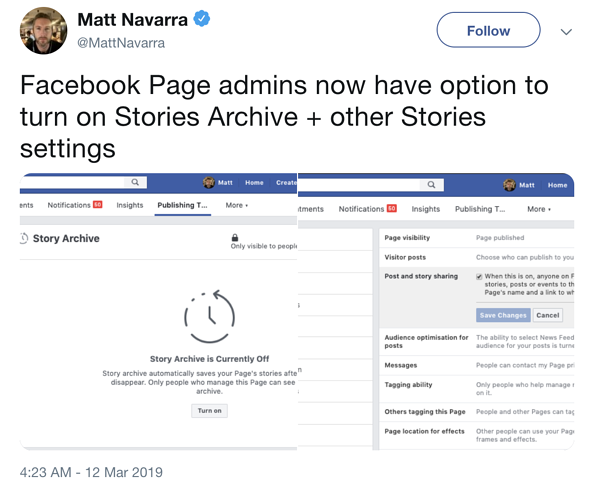 Along with their efforts to increase user adoption of Stories, Facebook also released new options for brands to take advantage of Stories for their company pages. Brands can now archive and share the stories they post, allowing them to reach more people and prolong the shelf-life of their efforts. Facebook hopes that this will increase brand use of the Stories tool, and there are key ways for marketers to leverage these changes to improve your strategy. News of this update first came after Twitter user Matt Navarra tweeted pictures of the new functionality. As you can see, page admins can now better capitalize on the Stories they post on Facebook by using them even after 24 hours have passed. Archiving stories is very similar to the “Highlights” feature available on Instagram, where brands can save specific stories under categorized highlight sections on their profile page. This allows people to access the content, even after their initial 24-hour window. This feature has been widely adopted among individual profiles and business pages, so it makes sense that Facebook would expand this functionality its other major platform. As previously mentioned, this feature can help brands prolong the shelf-life of their efforts, and reach more people that they might have missed in the original 24-hour window. Brands can also use this to promote deals or sale items, new product lines, or save any influencer work they’ve done in the past. This can also help brands keep historical information on Story performance, which can help marketers create better strategies for future social media efforts based on what’s been successful in the past. The “Sharing” feature is also one we’ve seen on Instagram. Just like the Facebook-owned app, when a brand turns on “Story Sharing” any Facebook user can re-post your Page Stories onto their own. According to Facebook, sharing “includes your Page’s name and a link to what you originally shared,” which can be great for expanding your reach into a wider audience. Again, this is a widely-used feature on Instagram, so it’s likely it will be successful among Facebook users as well. To turn on Story Sharing, navigate to “Page Settings” on your Facebook business profile. You’ll find the option under the “general” tab. Note: Turning on Story Sharing will also turn on post sharing for any organic Facebook posts your company makes. Stories provide an opportunity for brands to expand their reach and share updates with your audience in real-time - and Facebook’s update allows you to get more out of the content you post to your stories. Brands can use these features in their day-to-day posting, or for expanding your reach on big events, like employee outings or conferences. For example, if your brand hosts an event, you’re going to want to cover it in real-time for your followers. With these new features, you can better engage your audience, whether they’re attending the event or not. You can share attendee’s posts to your own story, and also achieve highlights to attract new attendees for the following year. For companies looking to hire, you can attract top talent by archiving team building activities or share employee’s post to showcase your culture. 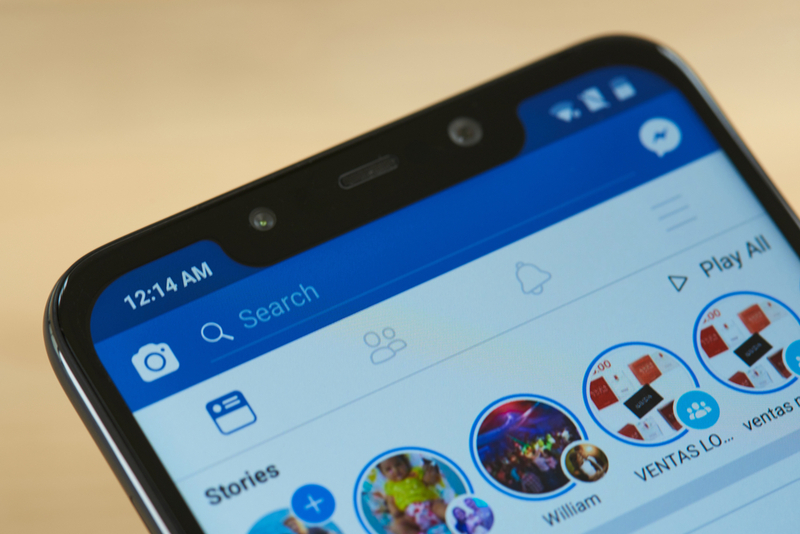 Recent research has shown that Facebook Stories is growing 15x faster than news feed sharing, so if you’re looking to captivate attention on the platform organically, this is a great way to get started.